In honor of our favorite green holiday, we wanted to spotlight some healthy GREEN foods! Here’s a list of some of them that you can really benefit from eating on a regular basis– Just to name a few! Arugula: a type of salad green that provides an abundant source of vitamins A and C for beautiful skin and immune boosting–and folic acid! Check out our Green Pizza made with arugula! Asparagus: naturally fights aging and contains antioxidants that help to product skin from sun damage. It also contains a large amount of folate. Try these Salmon and Asparagus Spring Rolls! Broccoli: packs vitamin C, A and K which is needed for strong bones. Also a great source for iron! Try our Belly flattening Weight Loss Smoothie! Brussels Sprouts: contain antioxidants and large amounts of fiber. They also contain cancer fighting compounds! Spritz with olive oil and roast in the oven. Scrumptious! Cucumbers: contain 90% water while also providing vitamin A, C and potassium! They hydrate your body and your skin, helping you to look youthful! Kale: known to help with eye protection and one of our true loves. Check out our Lemon –Garlic Spinach and Kale! Kiwi Fruit: great source of vitamin C, potassium and fiber. Also great for a quick snack! Lime: contains a large amount of vitamin C which helps to build your immune system. And the list continues on and on and on…! 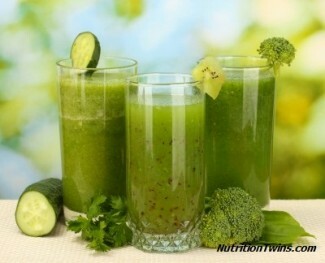 Let’s celebrate St. Patrick’s day by blending up this delicious smoothie with some of your favorite green foods! NOTE: There are many combinations of green foods to try. Try experimenting to see what you love best! What other ways have you incorporated green foods into your diet?